I have the pleasure of being invited to exhibit at Mt. Holyoke College, a series of work from a feminist point of view at 5 College Women's Research Center. 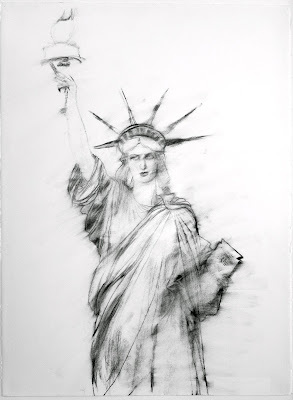 It seemed appropriate to focus on the strongest image of a woman that is know worldwide, The Statue of Liberty. In a time when so many of our civil rights have been eroded, I thought I'd start with Vanishing Liberty, a charcoal drawing which I started to erase. Other works to follow is the Statue of Liberty confronting a snake. A metaphor for our time.